Holy crap these weeks are flying by! It was SUCH a busy week this week, so I'm glad I survived and am happy for the weekend! I guess that's pretty much a given. I'm not sure I've ever heard anyone say, "oh boo, it's Friday." Let's go ahead and get this Random Roundup going! Necklace: Kendra Scott "Kathy" | Top: Express (other color options here, here, here) | Bottoms: Express | Shoes: Kate Spade "Licorice"
Sometimes I truly think that it takes longer for me to pick out my outfit in the morning than to actually put my makeup on and do my hair. 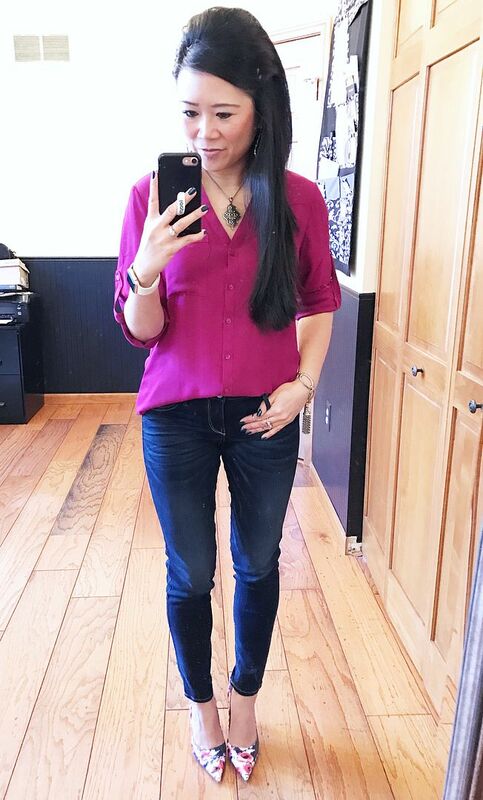 I had even less time than usual to get dressed this particular morning, so I fell back on some of my foolproof favorites - a good old portofino top and some pointy toed heels. I also call this my fake-fancy side do. It's basically the same thing as a low-slung side pony tail, but I pin it instead of use a pony tail holder, which makes it feel fancier to me. And also looks like I tried a little bit more, but I really didn't. 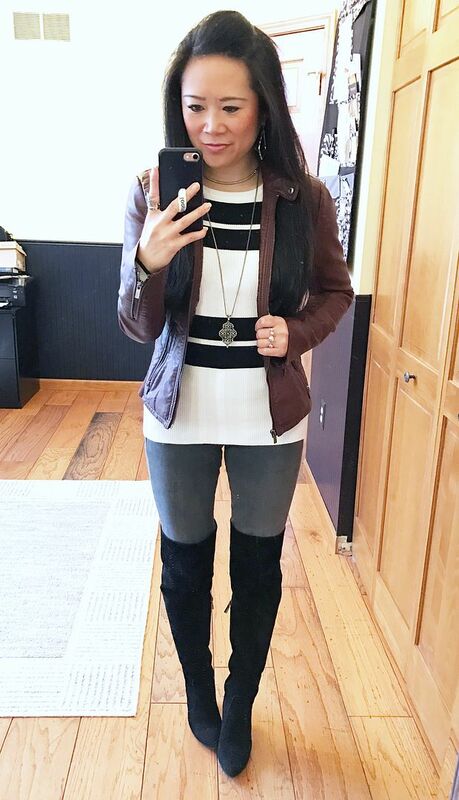 Speaking of foolproof favorites - stripes, skinnies, a moto jacket, and over the knee boots make for another combo that I know will always work. I've been wearing a lot of black and white lately, which really isn't me. I like it, don't get me wrong, but it's usually one of the last combos I think of wearing. I had to add my reddish brown moto jacket as my color pop. Remember last week's post when I styled my new gold loafers and I mentioned wanting to wear it with faux leather leggings, a stripe tunic, and a denim jacket? Well, voila! Though, these are not faux leather. They're my regular leggings that I ended up wearing to Pilates right after work. 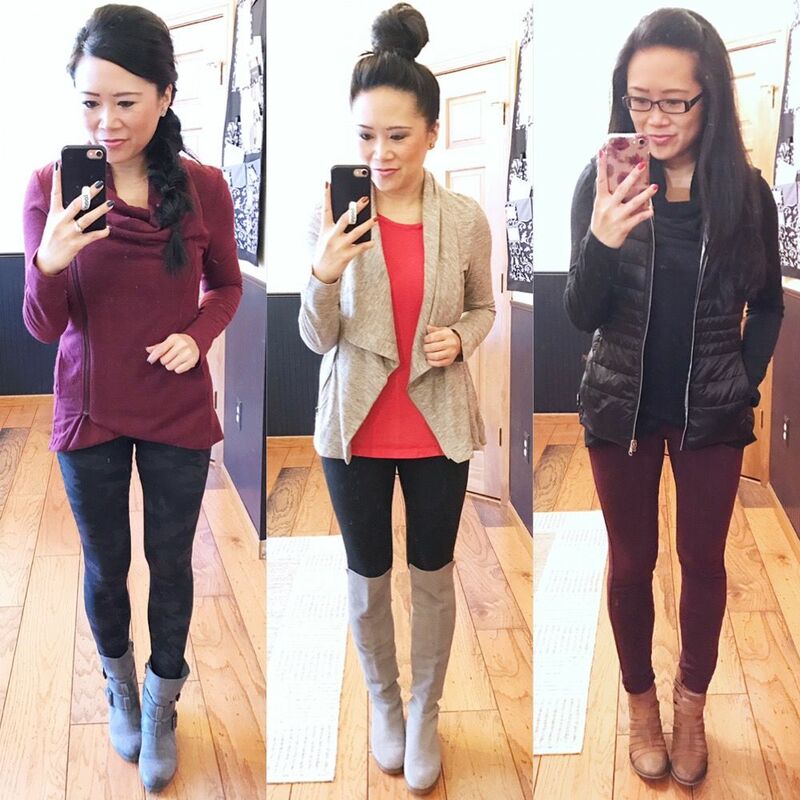 Mondays I have Pilates right after work and Fridays I have Pilates at lunch, so I've found myself wearing athleisure both days to help save time transitioning from work life to Pilates life. 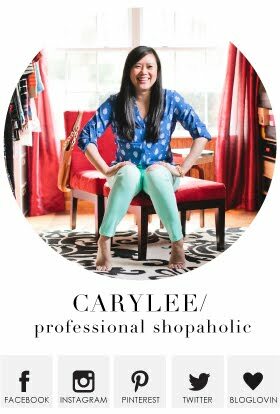 I'm thankful that I have a job that allows me to be that flexible in both my schedule and my wardrobe! Sweater: Modcloth "Airport Greeting" cardigan | Top: Express Barcelona cami | Necklace: Kendra Scott "Rayne" (gifted) (other colors here) | Leggings: Athleta "ponte luxe legging" | Booties: Matt Bernson "Brooklyn"
See, I wasn't lying when I said I turn to it often. I've had my burgundy one for 3+ years now, but this year I fell back in love with it and decided I needed more colors. I think the grey one is calling my name next. Or maybe blue. Decisions decisions!!! Ok, that's it for this week! Tomorrow I have a fun morning of Pilates and brunch, which you know are two of my most favorite things! Hope you have a great weekend, and if you're celebrating Valentine's Day with your loves, enjoy it! I get dress super fast in the morning I really don't know how I do it, but in my subconscious I'm sure I have like 1000 outfit formulas. Must be all the blog reading I do lol. 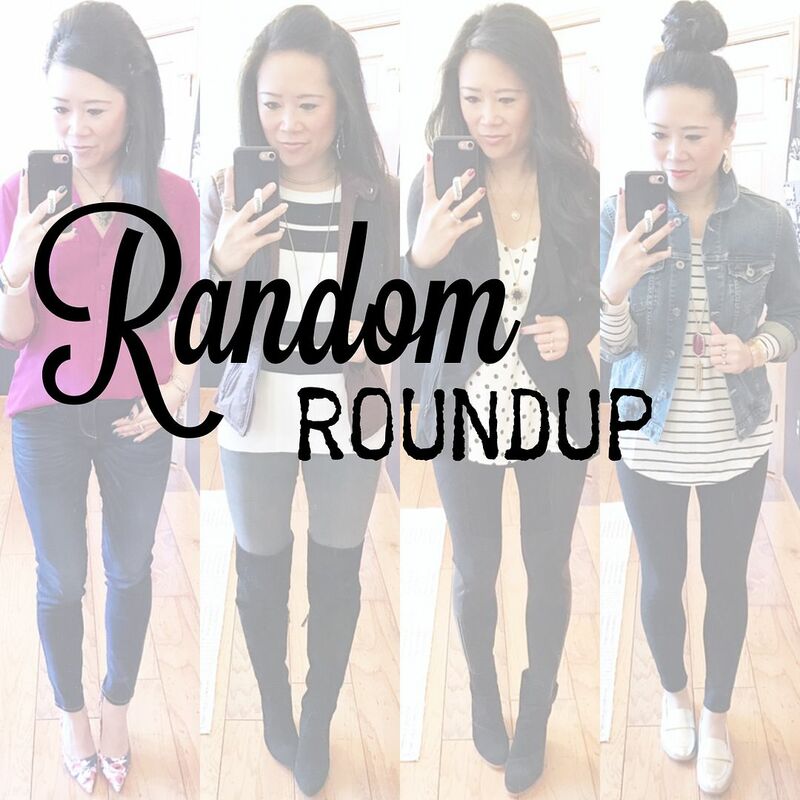 Love your roundup this week. 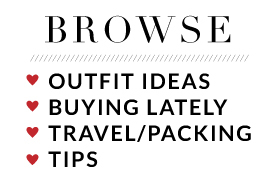 It takes me a long time to get dressed too...especially when it comes down to choosing shoes/bag/accessories. If I try 2-3 options each for shoes, bags and necklace...that adds up! Also funny that you feel like black and white isn't you! 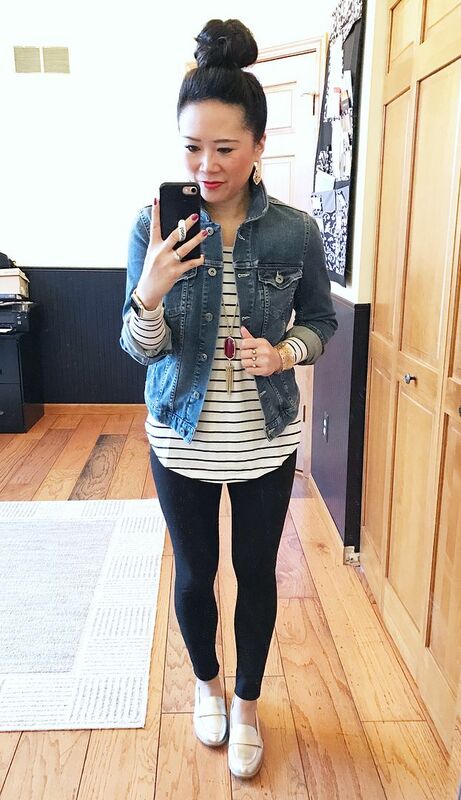 I have really been loving your black and white looks lately and plotting how I can duplicate the striped sweater/grey jeans look! That cardigan is a great piece! I can see why you have it in multiple colors! It is super cute zipped up or open. It drapes so nicely! Hmm. Well the wall opposite of where I am standing is one giant window which certainly helps let a ton of light in. I don't use any filters but I do still use the Aviary app to brighten my pics and adjust the colors because my wood floor and the yellow paint in this room tend to make my pictures look overly warm and yellow. And that's about it! Thanks for the kind words!